For a synopsis of my conference presentation see the tab " EXPERIENCE FROM PH PROJECTS"
If you missed the 2016 & 2017 open house days there will be somemore 5cSBD projects to see at the 2019 open days (see the list on the 5cSBD projects tab). Access details will be announced here before the Passive House and Sustainable House Open Days. Low cost suburban house completed and occupied in February 2017. Carbon positive, very low energy. The next building Certified as Passivhaus Plus. virtually Zero heating demand, totally solar - no other energy source. SUNSTONE completed in Feb 2017 is one of the few projects in the world certified as Passivhaus Plus and the first outside Europe. 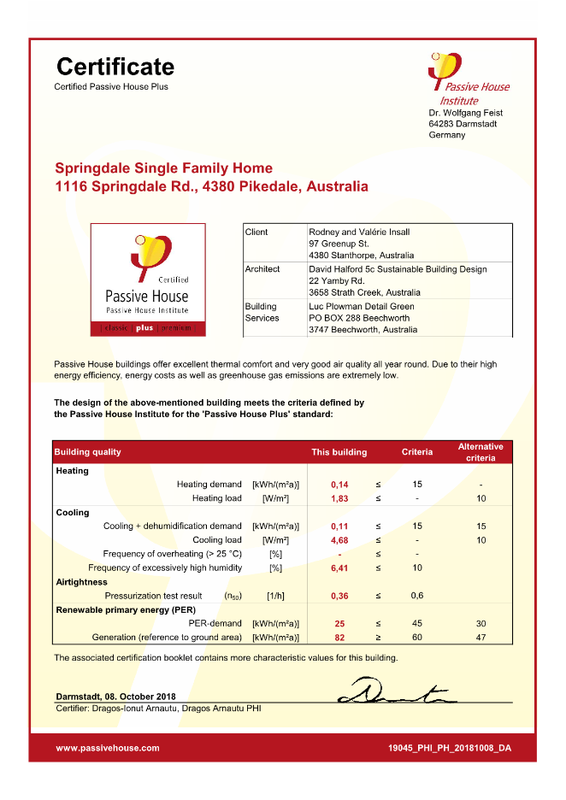 SPRINGDALE completed in August 2017 was the next Passive House Plus project. Yarramead & Harcourt currently nearing completion will also be PH Plus. Yea School is due to be the first PH school in the southern hemisphere. "Passivhaus" is the name of a calculation system that provides third party certification of strict comfort and energy criteria. Passive House and Passive Solar are general terms often applied to any building with windows facing the sun. David Halford is a Certified Passive House Designer, a Registered Building Designer in Victoria and Queensland and ARB registered in the UK. With several decades of designing energy efficient buildings and three designs already approved by the Passivhaus (PH) Institute, I have experience in most of the elements that are required to achieve a successful design. The great benefit of PH design is that it allows the effect of every design choice to be calculated so that the most cost-effective solutions can be identified. Good architecture is about much more than technicalities and the ability to calculate the effect of decisions liberates the designer so that the technicalities serve the design rather than the design being limited by the technicalities. The good news is that compared with the cold, dark climates of Northern Europe, the physical requirements for achieving PH in Australia are fairly easy. In fact it is cost effective to go beyond the PH minimums to carbon positive and even totally solar. The challenges are in sourcing suitable components, installers and materials at reasonable prices. I have learnt from sometimes bitter experience how to meet most of these challenges. My long experience in the industry and also in building my self-sufficient house with my own hands helps me understand what is critical/valuable both in the design and construction of buildings. My UK experience also gives me a wider perspective on what is available in the world and what is best practice. Current projects on site include some of the first “Passivhaus Plus” designs in the world as well as other carbon positive Passive House designs. Several other Passivhaus designs in 3 Australian States are underwayincluding a school in regional Victoria.